The papers printed in this Report were presented at a Symposium held at the University of Kent, Canterbury, in January 1977. The Symposium was jointly sponsored by the Council for British Archaeology and the Nautical Archaeology Trust. It was the first such joint enterprise between these two bodies, and was designed to bring nautical and 'land-based' archaeologists together for the first time. Programme planning was in the hands of a small working party consisting of Professor Barry Cunliffe, the late Paul Johnstone, Mrs Margaret Rule (Secretary, NAT), and Henry Cleere (Director, CBA); after Paul's untimely death, Mrs Valerie Fenwick joined the working party to represent the NAT. The Symposium was well attended, and the participants were drawn from a number of western European countries. The discussions on the papers-and, perhaps more important, more informal discussions outside the conference hall-showed how important the initiative taken by the two sponsoring bodies was: it became clear that the two groups were to a large extent unaware of one another's results and problems. It is to be hoped that the contacts established in this way will lead to closer links being formed between nautical and land archaeologists for the joint solution of these and similar problems. 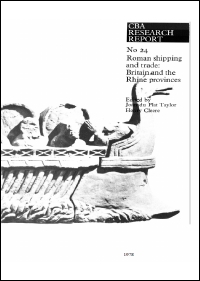 The papers fall into two groups: four papers reporting recent discoveries of boats of the Roman period in the Rhine provinces are followed by a bridging paper on harbours in Britain, which leads into the second group of papers on the archaeological evidence for trade. The final paper, by Dr John Peter Wild, is by way of a summing up of the proceedings, with some valuable observations based on his own work on the textile industry of the Roman period.